Bob Parsons, CEO of GoDaddy (yea he kills elephants but whatever he says here makes good sense): “Robert, they can’t eat you!” My rules for success in business and life in general. 2009 has been a tough year for me, personally. It wasn’t because of the economy. Reading my previous year’s ‘looking back’ post, I remember that I had ended the year with lots of optimism and hopes. It wasn’t to be as I endured a difficult time mentally and emotionally as I struggled to balance all aspects of my life, but I remain grateful – for no matter how difficult it was, I am still able to remain relatively healthy and my loved ones are all well. That to me, is already a blessing I am happy to be able to count, because I know for a fact that many people are not aware of how blessed they are on an everyday basis. I wanted to title this as time-management, but I have gradually grown to realise that the root of the problem is not that I don’t know how to manage my time properly or that I am not disciplined enough. For almost all my life I have pointed the finger at myself for being a procrastinator and that led to feelings of self-guilt and undermining my own value. I had almost come to accept the fact that I simply cannot manage time. The problem was never the management of time, but the expectations I have laid upon myself. It is ironic because I have a relatively low self-esteem but somehow I have sky-high expectations of myself. I have this super-woman mentality that I can manage a few major processes going on at the same time and come out fine. It is one thing to have a survivor’s mentality but another thing to put myself through all the unnecessary stress. I had overestimated my ability to multi-task and the time it takes to accomplish things. I always seem to think that I can be fast (very Aries of me). If I had set reasonable expectations for myself, I would have met them well and would not have put myself in the stressful situation of being in danger of not meeting deadlines, or trying to manage multiple timelines at one go. I have learnt time management is all about setting small, achievable targets – I mean, if I expect myself to be superwoman (which I am not, or else I wouldn’t even be writing this), obviously I wouldn’t be able to fulfill the tasks I have set up for myself. At one stage in 2009, I was in the middle of a huge residential move, taking on a new spiritual course, plus juggling about 5 major work projects, taking care of a dog with behavioral problems; all at the same time. It did not come as a surprise when I was on the verge of a breakdown, physically, mentally, emotionally and spiritually. If this was to happen a couple of years earlier, I would be blaming my luck or whatever else I could blame upon. However, I took this setback very personally, it took me a long time to stop blaming myself for it. I fell out of love with my work, my work which I so preciously hold dear to my heart. I tie my self-identity to my work and the work I create, when things do not go well with my work, I crumble. It is hard not to fall out of love with it when I am just so burnt out. Not to mention my living quarters had more than 50 huge un-packed boxes. And a dog who refused to stop barking. I was lost. But I took responsibility for it, I sent apologies to all parties involved and decided that the only thing I could do, is just to put in my best. I stopped accepting new work apart from those I was sure that I could manage. I took myself apart to rebuild my self again. And I think I am still in the midst of rebuilding it. Right now, I am careful with every decision I make, especially with work. I cannot help but feel apprehensive because I have this phobia of repeating the same mistake. However, I know I cannot be over-protective or I will just miss out on plenty opportunities. I can only put in my best and hope for the best. This past year, I’ve been putting in a lot of effort into loving myself more. I know this sounds egoistic, but I haven’t been loving myself for most of my life. Like honestly. I don’t give myself enough credit and I beat myself up hopelessly when things go wrong. This whole self-image thing is central to the many other issues that is going on in my life and to the previous point as well. When things did not go well, all I could do was to lament how incapable I was instead of encouraging myself to do better the next time. Lack of self love -> Under-value self -> Under charge -> Takes in lots of work to survive -> Lots of stress generated -> Procrastinate because of stress -> Unable to manage timelines properly -> Creativity takes a hit -> Start blaming myself for being unable to create to my own expectations -> Self-hatred begins. Sidenote: I have seldom missed a deadline in the past year regardless of all my issues. I would rather slave-drive myself than to disappoint my clients. Unless I fell physically sick, which I took full responsibility for. Work and other personal responsibilities took over my life for the past year, I think I could have read a bit more, played a bit more, watched a few more movies, relaxed a bit more, exercised a lot more. I tend to swing from extreme to extreme so it is important for me to learn how to go in-between. Being energetically sensitive (okay stop rolling your eyes now ;p), I sort of stopped going out to meet people since 2006. It makes me feel drained and I take quite a while to recover from it. It was a good and much needed break, but I forgone plenty of opportunities in doing that. Everything exists in duality, in avoiding negativity and I had to avoid positivity as well. Plus, I had self-image issues so I have a phobia of meeting strangers. It all started from the AWARE incident which made me realise that I need to know like-minded people to achieve any cause. That it can actually be empowering instead of disempowering. From coming out of my self-created hermit hole, I managed to meet tons of great people who have in turned brought tons of great relationships and opportunities. Amidst all the mess going on, I am glad that I managed to squeeze the time and resources to visit Julia, my spiritual mother in Tokyo, which whetted my appetite for more. Each time I travel out of Singapore I feel a sense of liberation and joy I cannot simply explain in words. I am proud that I did not allow my financial insecurity to stop me from travelling. It was a priceless experience. An ex-client from Hongkong I worked remotely and briefly with, popped by Singapore and bought me tickets to watch Denise Ho’s concert after I casually mentioned it to her. I haven’t even met her prior to this and she graciously bought the tickets for me, and invited me over to stay at her place during my two-week trip. I could have burgled her house for god’s sake but she trusted me unconditionally; I was almost a stranger to her. Thank you, Belle. I appreciate all of these from the bottom of my heart. This happened at a time when things was not going well for me and it re-affirmed my faith in people and the Universe. If not for my earlier decision to reverse my hermit-dom, I wouldn’t have accepted the invitation to meet up and I would have missed this learning experience. The Hongkong trip was significant to me because it was the first time I sort of travelled alone (my partner left for Singapore after one week). I am the sort of person who is afraid of being alone in the dark and this was a major step out for me. It gave me the confidence to do this traveling thing alone. Apart from that, I had the chance to catch one of the greatest concerts I’ve ever watched and the concert inspired me very much, both on a professional and personal level. Again, I put aside my financial insecurity to make this trip and it was very, very much worth it. This is again, tied to my self-image and I have been afraid to voice my true feelings and opinions because I was worried about how people would take them. Will they see me as some weirdo? Or will my clients get upset if I tell them what I truly feel? Can I stand up for myself against nasty clients? As I grew in self-confidence after I re-valued myself (like some property, haha), I decided that it was very important to me that I find my voice back. I used to be totally self-confident and vocal when I was a kid and I lost that part of me when my life turned up-side down during my teenage years. I needed to be true, true to myself, and to people. Finding my voice was triggered by the AWARE incident as I struggled whether to air my potentially radical views publicly or not. I finally came to the conclusion that I am my Self and I need to stay true to that self. I put my true self out there and it is up to people whether they want to accept me for me or not. Those who can’t, will not be a good fit for me anyway. It will only be tiresome and will not be of any value to both parties if we all have to put on fake fronts and hypocritical smiles. This was a major epiphany for me. For realising it was never about the luck, the environment, the people, the circumstances. It is all about how I choose to perceive and believe. Everything, everything can be good or bad, it is how one looks at it. The difference between success and failure is the ability to control the mind. To train the mind and not let the mind train you. The mind is truly powerful, it can sabotage or it can empower. It just takes a flip of a mind-switch to make a radical difference but the difficulty is to convince oneself to flip that switch. If I truly want something, I have to make that effort, no matter how great it is. It is entirely up to me whether I want to put in that extra inch or mile. Everyone has the power to will themselves into doing anything. “Cannot help it” is a bad excuse. The circumstances can be bad, people can be critical, but if you don’t believe in yourself at the very least, or make the effort to go that extra mile, who’s going to do it for you? Nobody. So I have to do it for myself. And if I don’t have the will to do it for myself, then who else but myself is the greatest enemy? Nobody has the ability to create that negative situation or that bleak outlook apart from oneself. If there are people who can make the best out of crappy situations (Stephen Hawking, for example, has lost the use of his limbs but he is still contributing to the world, or Avram Grant’s dad who had to bury his parents and siblings during world war II and still feel positive about life), then it is up to us to determine how negative or positive a situation can be. It is all relative. Twitter and my twitter friends, for being my source of comfort when the going gets tough. Not sure what I’ll do without the internet, seriously. I wouldn’t even have a career! Can’t imagine if I was born a century earlier. Those of you who believe in the magic of the universe, thank you for making me feel sane. Here’s to a great 2010! I fell really sick for the past two days. It seemed like somebody was trying to drive the whole point across to me about not taking my health for granted. I thought it didn’t seem like a coincidence that this bout of sickness came right after I wrote my previous post. I had a chance to experience how does it really feel like to be totally disempowered as I lay in bed feeling really ill and restless, yet not possessing an ounce of energy to do anything. It is kinda ironic, because I had such grand plans and hopes for these few days as I told myself after writing the previous post that I’ll want to make better use of my time. Only to be hit with a cold, stark reminder that it is not up to us when we’ll like to make good use of time or not. The moment I actually felt like accomplishing something, I fell ill. While being static on bed I wondered about all those times I had been in perfect health and yet chose to idle my time away. What if this spate of illness lasts more than a few days? What if from this very moment onwards I lose my health for good? Since am a perpetual worrier and am always under stress and not eating properly of having enough exercise, I do get sick rather often, but I usually recover in a matter of a day or two. I’ve been blessed with good health overall, till date I have not had any major illnesses or injuries (touch wood). Yet this is the first time I am giving serious contemplation that my illness may last more than mere days with the possibilities following it. Not because I really feel that I’ll continue to be sick, but I have has this chance to really think about it instead of just taking for granted that I am bound to recover. Simon Cowell wrote a surprisingly honest, open letter to his younger self to celebrate his 50th birthday. This is a letter that probably many of us will relate to (especially if you enjoy reading this blog). So if you’re in your 20s to 30s and think you’ve just suffered a major failure or that you have achieved nothing so far and time is not on your side, read this letter. It does take something extraordinary to ‘rise out of the ashes’ instead of wallowing in self-defeat. Cowell also had the self-honesty to admit that his younger self was ‘shallow and self-obsessed’ and thought he wasted lots of time on parties and alcohol. What have you learned? Not to drink Galliano, that’s for sure. Today, on the eve of your 50th birthday, you are much more likely to drink two litres of water a day rather than a gallon of champagne. I have been buried in work, which in turn makes me feel like crap because I can’t seem to output anything that is of my own standards when there are deadlines everyday. I can point fingers at client-side delays inducing clashed schedules, unexpected events in my personal life (passing away of an uncle), bad luck (falling into a drain), but I won’t. Deep down in my heart, I know I can blame nobody but myself for the situation I was in. The intention started out positively. All I wanted was to kick-start my travel plans, so I took in more work to steady myself financially, believing that I will have the strength to overcome tight schedules and an increase of workload with the bigger picture in sight. There were also a couple of local startups in need of design help, I have always been a supporter of local talents and I felt that it was something I could do to give back. I ignored that little voice. That little voice that tells me that I was risking over-extending myself, taking my energy for granted and that I should think carefully whether I was capable of survival myself before offering my help to anyone else. On hindsight, perhaps I was meant to go through this period. It was the much needed splash of cold water on my face, telling me that I need to respect myself and my time more. That it is not to be taken for granted that I can work any piece of canvas into well-crafted websites. My own carelessness taught me a harsh lesson as I started to produce work that nauseated me. I am not sure why, but I seem to be overly harsh to myself. Each stumble I made, I cruelly chastised myself for being inefficient, unproductive, incapable, ill-disciplined, whatever negative word I can think of to describe myself. The high expectations upon myself is a double-edged sword. I could feel the shadows of my depression overcoming me once again. I felt my life-force slowing draining away from me. It is just work, right? I know. I just cannot tolerate myself for stepping into this vicious cycle, or ignoring my gut feel. I reminded myself repeatedly that my issues are non-issues compared to warring countries and starving children; I just can not help feeling as though I was sinking deeper and deeper into a bottomless pit. When I fell into a drain amidst really tight deadlines for my work, I started laughing at myself. No, I was not going mental because of the unfortunate events, but rather I was getting amused. I looked up at the sky above and asked, “What else?”. Amazingly, despite the really bad cuts on my leg and bruised ribs, I knew I was blessed. I knew I have been riding on my luck because I did not have any serious physical injuries since I was a kid. I knew the fall could have been worse, I could have ended up really badly injured rather than just cuts and bruises. I had ordered a few books from Amazon.com a few days before and for unknown reasons, they shipped half of my order by UPS even though I did not pay for it. In this particular shipment there was a book by Michael Newton – “Destiny of Souls”. I have read Newton’s first book on past life regression and hypnotherapy many months back and was totally fascinated with it. I put his second book on my shopping list for a long while and have only decided to buy it after I needed to buy a few other design-related books as well. Michael Newton holds a PhD. in Counseling Psychology and has been a professional hypnotherapist for years before accidentally regressing one of his cases to his past life. Since then he has handled thousands of cases, regressing them into their past lives and also in between lives. He was an atheist with a logical, scientifically trained mind and it took him quite a while to reconcile what he was experiencing. This was mind-opening for me personally, because though I have always believed in higher powers, it is altogether different when a doctor writes a book detailing thousands of recorded cases. Thousands of people from different walks of life, many non-religious, but providing very similar information pointing to dimensions beyond us. Due to my fall I was not able to work for a day as I was in considerable pain, forced to be bedridden. This is why I always say, we can all have the best laid plans but the Universe usually have other ideas for us. Co-incidentally (no, actually I don’t believe in co-incidences anymore) the books arrived by UPS within a few days after the order! I have ordered books from Amazon many times before and this is the first time they despatched my order into two within the same day, to two different postal carriers. The usual wait is two weeks at least but this time I ordered on a Friday and received them on Monday morning. I had time to read the book because I cannot do much except to be in bed. I finished the book while nursing my wounds, throughout the read I was constantly getting reminded what life is all about. The book was gradually pulling me out of my self-built pit and was somehow gently telling me that I have better things to do than mope (which I have already known but was too caught up with perceived practicalities of life). I was still contemplating about the contents of the book when I had to reply to an email by my spiritual mother (long story) and was halfway lamenting about my sorry situation before it dawned upon me that this is not the way I want to spend my life. Moping. I want to remember my life as a life I am proud of, not a life full of wallowing in self-pity. I can be plagued by a series of unfortunate events but so what? There is no point in feeling ‘unlucky’. It does not do anything to help the situation. When one stops fearing misfortune and the unknown, one achieves a sense of liberation. I have been blessed enough to be aware enough not to be tied down too much by the supposed practicalities of life and the reality set down upon me by others, but being human I kept losing my way. I accept this because this is part of the human experience. No matter how spiritually aware one can be, there is always bound to be ups and downs, greater challenges than the previous one. This is the point of life. To keep learning. I am grateful because somehow I am being guided back to the path intended for me. Silently and steadily. When one stops fearing misfortune and the unknown, one achieves a sense of liberation. I understand that I will need to learn how to cope with my overwhelming emotions and underwhelming self-image. It cannot be expected to be eradicated so soon after a lifetime of deep-routed programming and god knows how many past life-times. My spiritual mother (yes this sounds funny but I cannot think of a better term), Julia, once commented I am the only person she knows that is so obsessed about past-lives. While signing up for the Soul Realignment course, Andrea Hess told me that I would not want to sign up if I am not able to do it. Thinking about this along the same line, perhaps there is a reason why I am obsessed and intrigued about past lives. There is a reason for every soul’s desire, right? So halfway typing the email to Julia (yes I have an issue with digression) I realised that this is what I really want to do and why not? What is stopping me? To be honest, I am afraid to cope financially. This a rational fear and I am sure many others while seeking their way to their goals feel the same as well. However, this time I am determined not to let it stop me. Pursuing my spiritual interests has been part of me for a long while now and why should I not? I can only get too impatient and eager to learn. Perhaps I have been in denial about my work for a long time. Each time I think it is a passing phase caused by stress, but it has been a long time since I genuinely feel excited about a design project. The catch-22 situation here is, perhaps if I can find ways to diversify my income streams, I would not face so much pressure from my design work and that will enable me to produce work of a higher quality, and that will in turn allow me to work with better clients and budgets, which will also allow me to rediscover my love for design again. It is very much a part of me, so much a part of me that I am afraid to let go. Yet I know I have to let it go first in order to find it back again. This applies to a lot in life isn’t it? I have had irrational fears, behaviors, reactions, inexplicable happenings. I had felt I do not belong to this world. There are just too many things in this world that cannot be explained by logic. When I was a child I never understood why I had to live, the thing is, people are so afraid of death right, most of them want to live. For me, everyday I wished for death. I did not know why. To be honest I never had a particularly harsh childhood, there was a lot of rejection and emotional pain but it was not as though I was made to beg on the streets. Awakening spiritually was a life-turning point for me.I still don’t quite get it why we have to progress spiritually in order to rejoin the Source one day, like why even start this process in the first place, or why was there even a Source in the beginning. However, it meant a lot to me that there are reasons why I have certain feelings. I realise (thank god for the internet!) that there are many others like me. They are still in the minority, and there are many who did not have the luck or blessing to experience spiritual support (like I have Julia with me) or an awakening process. I know how it feels like to feel alienated and weird and I feel that I can learn to provide some form of support to these people. I went through a Soul Realignment reading for myself and introduced Julia to it. We both found it really beneficial in different ways individually, it brought a lot of clarity to what we have been experiencing in the past. Imagine being able to remember why you came into this life, why you have seemingly unresolvable issues with a parent, why you are afraid of heights or water, why you have an unexplainable pain in a certain part of your body. There is always the conflict of – perhaps we’re not supposed to know that much, but I am slowly believing in ‘when the student is ready, the teacher appears’. We’re supposed to gain the information we are already meant to know. I feel my empathy is gifted to me for a reason. This will not be my only stop. I have a deep-rooted interest to learn spiritual regression, animal communication, alternative healing, the list goes on. I am not sure when I will be equipped to actually provide any help, but I will know it when the time comes. I hope to blend whatever knowledge I will eventually acquire into some form of personalised support to people drawn to seek my help. I hope to be a conduit in some form because I had felt helpless before and I know how much difference it makes to have means of support and empathy. This is what I desire, I do not know if I will eventually succeed or if I will lack the patience to persevere but at this very moment I will give it my best shot. I have been somewhat neglecting this blog, not without proper reasons. Few months ago I have decided that I want to realise my travel plans by this year, so I set my heart to it, taking on work so that I would be in a good state financially to embark on my travels later this year. Just that I probably took on much more than I should. I had spent the last couple of weeks before my birthday frantically trying to tie up loose ends, meet not-very-realistic deadlines, all because I wanted to go for a week’s trip to spend my birthday in peace. I have never been a huge fan of my own birthdays, but have learnt to respect the special day that marks the time of my birth. This time I planned a month or two in advance, not knowing of the destination yet, but notifying all my clients that I will be away for a week. To be really honest I do not think it is a matter of life and death if a project was delayed for five working days (four actually, with good friday), but somehow I let the guilt that should not have existed eat into me and I agreed to deadlines that were never possible in the first place. Deadlines that were supposed to take place before my birthday so that the world can continue to function during my absence. The result was a lot of unnecessary stress, till the day before my departure, I was effectively burnt out. I could not do a single thing except wait for time to pass. I was simply drained. I still did not manage to meet a couple of deadlines despite my best effort but I was aided by the client-decided delays of a couple of projects. For the one deadline I genuinely thought I would meet but did not, I wrote a very honest email to the client describing my not very creative-state-of-mind. It would be ideal if he understood, if he did not, I can only say that I have tried my best. I knew there was nobody else but me to blame. I let this happen to myself. One year ago around this time of the year, my parents almost perished in the Sichuan quake, surviving only by a twist of fate that delayed their road trip by a few minutes and not less, because they found themselves in the middle of two huge landslides. If they have been earlier, they would have been gone, same goes for few minutes later. I was in the same situation at that time last year, burning myself out with work, postponing family dinners because I was ‘too busy with work’. I almost never got to see them again. I made a promise to myself, to never let work take priority in my life, never should I burn myself out again. One year on, after seemingly having learnt from my previous lesson, I forgot about the promise I have made to myself. Ironically, because all I wanted was to be financially ready for my dream. This has been a recurring theme of my life. It has been such a vicious cycle that I am appalled at myself for not getting it after so many attempts. It just has to recur until I get it. And a new theme starts. I cannot promise that it will not recur again. However, I will try. My trip was almost ruined because of the guilt and baggage from work I had to carry, not to mention I almost fell sick again due to the lack of sleep and increased stress levels. Where is the line I should draw in working harder, setting boundaries, and yet maintaining the quality of my life? I was in the same situation, burning myself out with work, postponing family dinners because I was ‘too busy with work’. I almost never got to see them again. I made a promise to myself, to never let work take priority in my life, never should I burn myself out again. 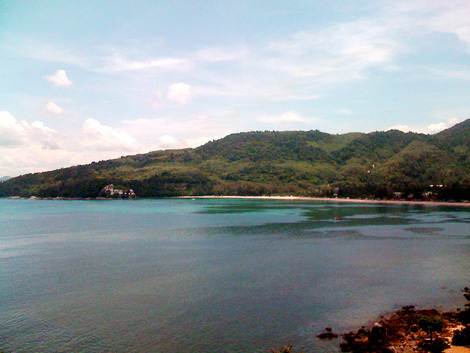 Looking at the beautiful beaches and seas of Phuket (no, Patong beach is not the only beach that Phuket has), basking myself under the solar rays blessed by the sun returning to the same astrological position on my day of birth, I made a renewed promise to myself. I will continue to put in my best for my work, but I will listen to my gut feel more. If it says no more new projects, I will need to listen to it. I have lost count of the times my gut tells me no, but I still carry on thinking that I am capable of exceeding my own expectations. How much would I have to give up to earn that extra bit? At the expense of my own well-being, mentally, emotionally, and physically. Taking in the sights, sounds and smells, pausing in the moment to appreciate Mother Earth’s natural beauty – that is how life should be, isn’t it? Nevertheless, looking at the neverending horizons, I felt blessed that I was able to make it to the trip in one piece. That somehow the Universe consipired to ease my workload prior to my departure, because I know it could have been worse if not for the unforeseen client-side delays. That the clients I have understood. That I have my health intact, my parents well, my partner by my side, and that I was able to afford that bit of luxury to even be at Phuket. That I do not have a huge circle of friends, yet a handful of true ones who know me for me. I am loved by the Universe, and I know it in my heart. I may not get the hang of finding the intricate balance between work and the rest of my life yet, but am slowly getting the hang of placing my undiluted trust and faith in the Universe. That alone makes me feel truly blessed, because despite being trapped in my own maze of confusion I have managed to rediscover the magic of the Universe. Happy birthday to me, and may I be blessed enough to spend the rest of my birthdays basking in the magical energy of Light – that gives life to all. Lucian writes a beautiful post for his children (he writes the most beautiful words for his family) telling them to have belief and do not be quick to judge, using photography as his analogy, for it is usually the most unlikely times that yield the most breathtaking pictures. Raeal shares a story in his monthly column for Cosmic Lighthouse, a story that tells of having faith, even when hope seems to be at the bleakest. Two blog posts in the same day, touching on the same theme. I now know why I actually wanted to blog about Lucian’s post earlier in the day but somehow chose to wait. I understood the message when I read Raeal’s article later in the night. I am not Christian, but I do believe in God without human labels and I have been proven time and time again, that everything occurs in divine timing. Things will turn out the way it is exactly meant to be. Only the lack of faith and belief will sabotage it. Many a time people do not realise that you cannot expect miracles to happen when you do not believe in them yourself. Or good things to happen when you do not have faith in the good. The greatest lessons in life are often so simple, it is the human mind that often seeks to complicate things.